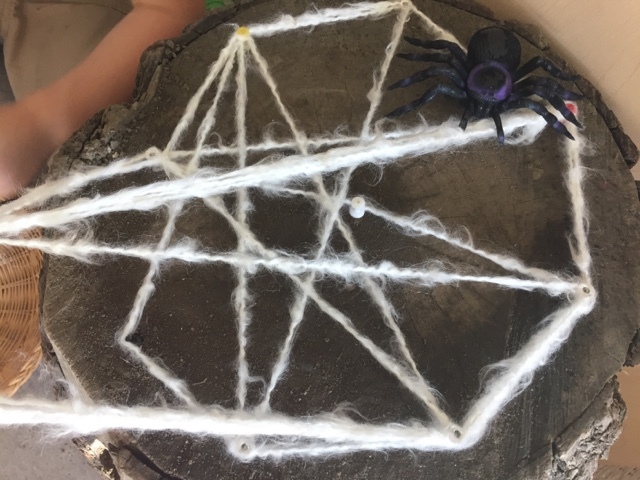 The children have continued with their interest in spiders so today I thought it would be fun to have a mini spider playscape that promoted cooperation, storytelling, and mathematical observations. We used two sturdy logs. 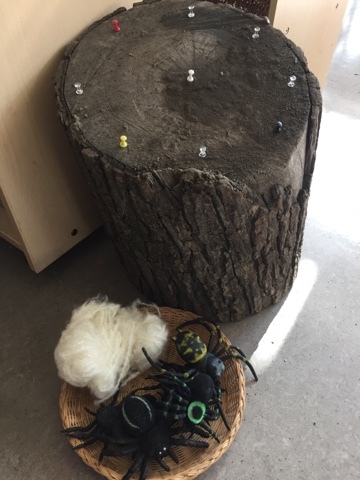 I stuck pushpins into the top surface of the log and encouraged the children to connect the logs with a mathematical experience or tool we have in our classroom. The children immediately suggested that the pegs on the log reminded them of our geoboards. We brainstormed how we could use the pegs to make spider webs. 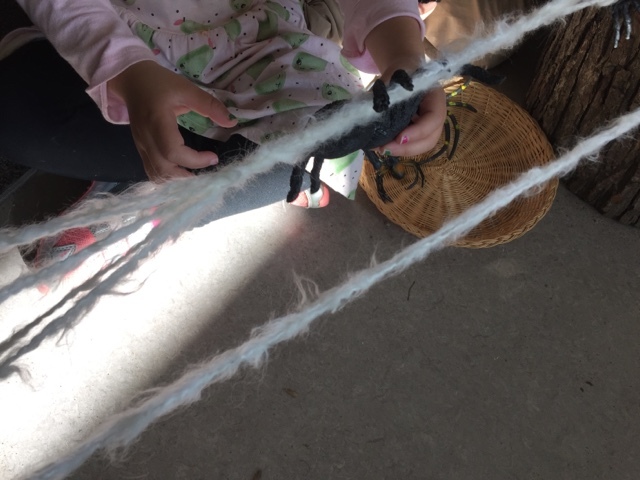 The children were keen to weave and wind fuzzy white yarn in order to make as realistic a web as possible. As the children wove they counted how many times around the pegs they went - 1, 2, 3... They noticed shapes emerging in the web and compared to see which was the largest shape. "Look! I see so many triangles! How many are there?" "The outside needs a longer piece of yarn than the middle." "It reminds me of a pizza with all the little parts inside." 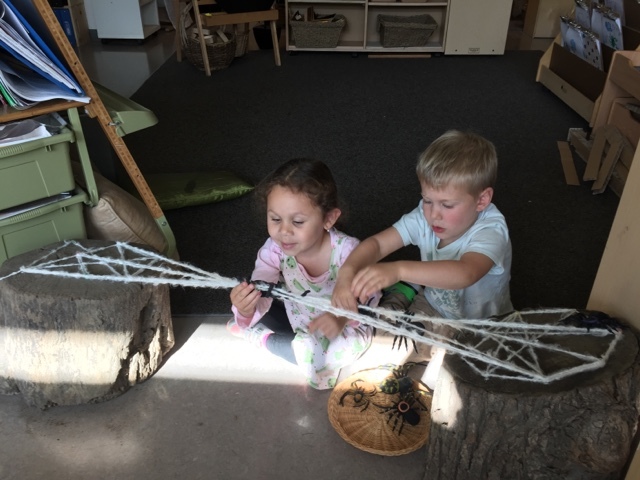 The children wanted to connect the two logs together with a web so the spiders could move from one place to another. They needed to cooperate and problem solve how to connect the webs without disrupting the original one. Once the web continued they needed to find a way to keep the web from unraveling. They noticed the bigger spiders were heavier and would sink lower on the middle web. 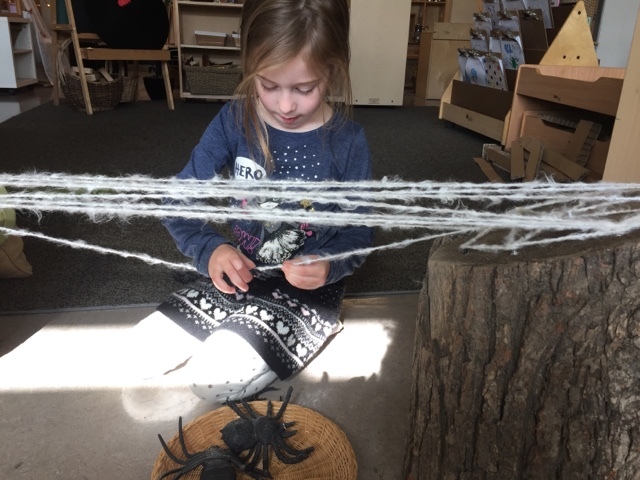 I overheard much rich mathematical conversation as the children played with the spiders. At the end of the day we unwound the web and I challenged the children to think of what we might add to the logs tomorrow to make the spider playscape even more interesting....perhaps some prey for the spiders? What would you add to the playscape?